Peel the sweet potatoes, cut them into smaller pieces and boil them. When the water boils add the cut sweet potatoes to the water and lower the heat. Simmer for 15 minutes or until the sweet potatoes can be easily pierced with a knife. Drain the sweet potatoes and return to the pot. 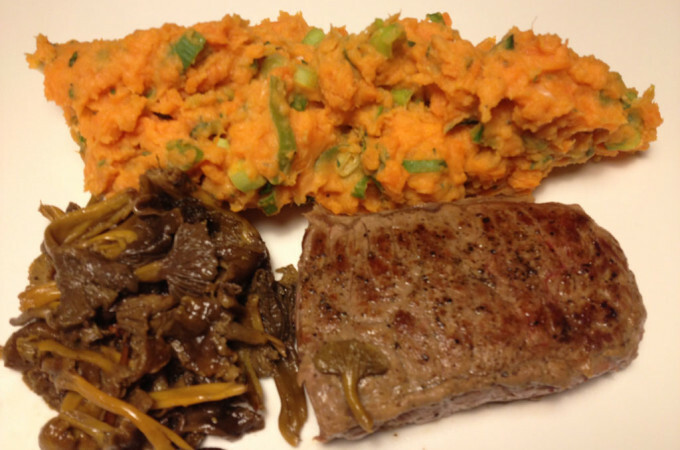 Mash the sweet potatoes with a potato masher. Add the low fat cream, fresh chopped basil, chopped spring onions and fresh black pepper. Grill the veal steak. Put the veal steak on a plate and let it ’rest’ for 5 minutes. Put the wild mushrooms in the heated pan, add fresh black pepper and ‘fry’ for 5 minutes. Why is it important to train with a fitness instructor? How Eva Georgieva won her WBFF pro card? How Silvestar went beyond his limits?